Our newest regional final venue, the fabulous Aspers Casino in Stratford hosted the first of our two London finals. 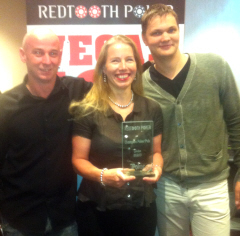 Nearly 200 players were all after one thing, a free pass into our Vegas 100 club. The team event went to the Horns Tavern in West Norwood. They were represented by Nigel Goodman, Alison White, Algirdas Kundells and Laimonas Plenta. They all took a nice crystal glass trophy back with them. Short stack Andrew Ormes exited the final table in 10th place and was followed by Ed Blackmore in 9th. This meant everyone else was guaranteed at least a cash prize and semi final seat. 8th place was Robert Taylor with Jonathan Francis 6th, Brett Ward 5th, Steve Shimmons 4th and Michael Panteli in 3rd. The heads-up match was between Graham Walker and Adam Mann. Graham Walker got his chips in with the best of it by tabling A-7 to Adam’s K-6. 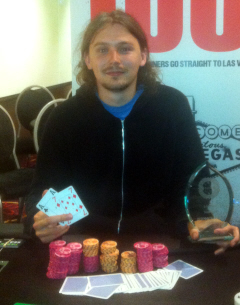 The board ran off 4-4-2-8-10 to make Graham Walker the latest Vegas 100 member!